DineEquity Inc.—owner of the IHOP and Applebee’s chains—and Denny’s top the list of large full-service restaurant chains that have been fined by the Department of Labor for wage and hour violations, based on a Bloomberg BNA analysis of DOL data. The number of violations dwarf those of fast-food restaurants such as McDonald’s or Subway that don’t employ waitstaff, as well as full-service restaurants like Darden Group that don’t operate 24-hours a day. Darden operates chains like Olive Garden. The prevalence of violations at full-service outlets highlights an ongoing issue related to wage violations connected to tipped waitstaff. This analysis follows up on a Bloomberg BNA report on the nearly 4,000 Obama-era DOL investigations at the 20 largest fast-food chains. 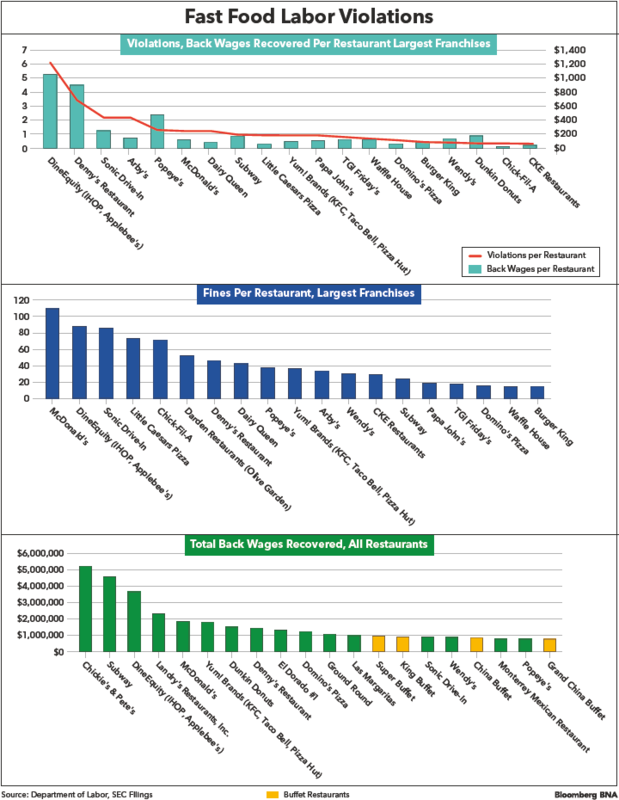 Of the 17 largest chain restaurants, DineEquity and Denny’s Restaurants had the largest rate of both violations and back wages recovered per restaurant. DineEquity topped the list with an average of six violations and over $1,000 in back wages recovered per restaurant, 88 percent of which were from the restaurant group’s IHOP chain. It also had the second highest rate of fines per restaurant, just below that of McDonald’s. Full-service restaurants generally employ more workers than limited service ones, so they might be expected to have a higher rate of infractions. But full-service restaurants had three and four times the rate of violations and back wages recovered on a per employee basis as those without waitstaff. Full-service restaurants were also heavily represented in the list of individual locations with the most violations. They made up 84 percent of the hundred largest violators, and 87 percent of the hundred largest back wage recoveries. Tipped salaries, besides being another layer of labor rules to violate, have a high incidence of abuse, particularly with employers not making up the difference between sub-minimum wage and the minimum wage when business is slow, Heidi Shierholz, senior economist with the left-leaning Economic Policy Institute and former chief economist at the Department of Labor, told Bloomberg BNA. “It’s an area that’s ripe for wage violations,” she said. Issues with tracking employee time under what’s known as the 80-20 rule and calculating overtime for tipped workers regularly lead to Fair Labor Standards Act violations, Teófilo Reyes, research director with Restaurant Opportunities Centers United (ROC United)—a restaurant workers advocacy group—told Bloomberg BNA. “For employers to pay waitstaff the sub-minimum wage, employees need to spend at least 80 percent of their time that’s directly facing the customer and that can be difficult to keep track of,” he said. Reyes also pointed to franchised establishments as a source of pressure that leads to tipped wage abuse: Large franchises with automated scheduling systems create incentives for managers to push more work on tipped employees and run afoul of the 80-20 rule. Both Denny’s and IHOP are unique in that many of their locations operate 24 hours a day. Waffle House, with a business model similar to Denny’s and IHOP, had significantly fewer violations, ranking 18th in terms of violations per restaurant. Reyes indicated that restaurants that operate at late hours have regular issues with tipped employees and wage theft, such as employees covering for customers who walk out without paying or if business is slow and the employer doesn’t properly track their hours. “If you look at 24-hour restaurants, you’ll see extensive wage and hour violations, and a non-trivial percentage of this is due to workers working for less than minimum wage on the night shift,” Reyes said. Sub-minimum wage can be a problem for both employers and employees, Jeffrey Ruzal, a labor law attorney with Epstein Becker & Green in New York, told Bloomberg BNA. “Certain states like New York and California can have unique wage and hour laws not adapted by the FLSA, and those nuanced requirements can cause trouble when employers are not aware of the rules,” he said. Wage and hour violation for one employee can easily turn into class actions for scores of employees, according to Ruzal. Even with just a handful of total locations, some restaurants had just as many violations as the larger chains. Chickie’s & Pete’s, a Philadelphia-area sports bar chain, topped the list of total back wages recovered for all restaurants regardless of size even though the restaurant’s website only lists 19 locations. The small chain had 262 times the rate of back wages recovered per restaurant and 30 times the rate of penalties per restaurant as DineEquity, the biggest violator among large-scale chains. Landry’s Inc.—the Houston-based parent company of full-service restaurants like McCormick and Schmick’s, Bubba Gump Shrimp Co., Rainforest Café and Morton’s Steakhouse— is listed as 4th in total back wages recovered and 10th in total penalties even though it only has 500 locations. The restaurant chain has over seven times the rate of violations per restaurant as McDonald’s. Buffets also featured prominently in the list of top 20 companies in terms of total back wages recovered. This includes Super Buffet ($970,000), King Buffet ($909,000), China Buffet ($848,000) and Grand China Buffet ($771,000). These restaurants paid more in back wages than seven of the largest chains. Only two of them—Grand China Buffet and Super Buffet—are listed as full-service. El Rancho Grande, a small Mexican food chain in Ohio, stood out with 11 separate violations tagged as “repeat and willful” in the DOL database, which is over twice that as the next highest willful repeat offender, various KFC restaurants in upstate New York and Connecticut under Yum! Brands. The DOL’s data on violations aren’t comprehensive as the department doesn’t inspect all possible locations. Certain larger chains, like Shake Shack, have no entries in the database and others, like In N’ Out Burger, have only one inspection listed with no violations found. Their websites list 313 and 78 U.S. locations, respectively. Inspections are chosen strategically by the department, based on research and tips about potential violations, according to Shierholz. “There are about 1,000 DOL employees and over 7.3 million workplaces, so it’s impossible for them to cover everything, but they do what they can,” she said. The database doesn’t include state and local government actions, and it may also not include restaurants where aggrieved employees sought redress through private lawsuits instead of a DOL complaint. Those complainants wouldn’t be able to seek redress from a DOL action because of restrictions on double jeopardy. Federal and state departments of labor have limited resources and can only focus on a small number of aggrieved employees, often where the employers are particularly bad actors or repeat offenders, according to Ruzal. “In most instances, an employee’s best resource is through a private lawsuit,” he added.